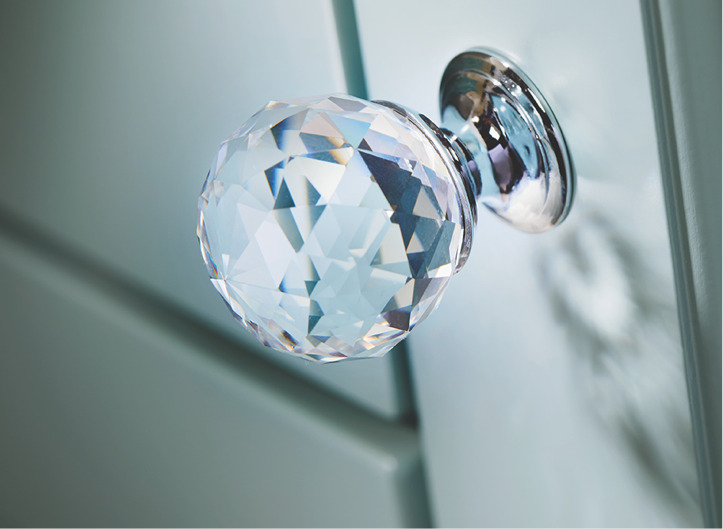 At Vanity Hall we believe exceptional craftsmanship and stunning contemporary design should be available to all homeowners. It’s why we created our VH2 range of affordable bathroom furniture. Featuring our signature styling and unparalleled attention to detail, the range offers uncompromising quality at an everyday price. A family bathroom will always benefit from storage and especially stoarge that has been carefully considered and well planned. Drawer units are ideal for storing smaller toiletries and wall cabinets provide perfect storage for both make-up and medicines that need to be kept of of reach of young children. For a more contemporary feel in your bathroom, consider drawer units, as opposed to cupboards? An offset single sit-on basin gives extra worktop space to the side, whilst more storage is achieve in the open shelf unit, perfect for decorative items and accessories. Have the best of both worlds by planning both drawers and cupboards into your bathroom or en-suite design. The worktop with matching upstand is made in stunning White Onyx Corian, the perfect complement to the intensly rich tones of the Carbon Marine woodgrain. 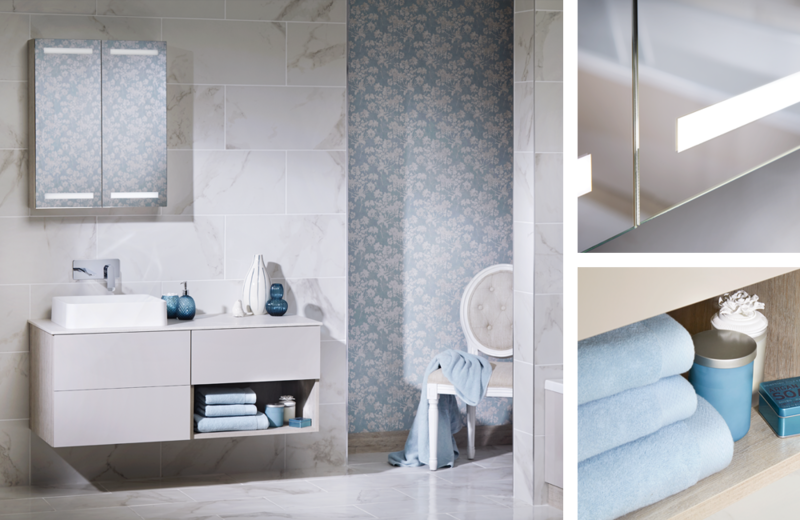 Add a feminine touch to a masculine en-suite or bathroom by accessorizing in a bold, fun colour! Hot yellow would have worked equally as well as fuschia pink in this en-suite… and when you fancy a change, simply update your bathroom with some new towels and a selection of decorative items. Twin basins, where space permits are both practical and eye-catching. 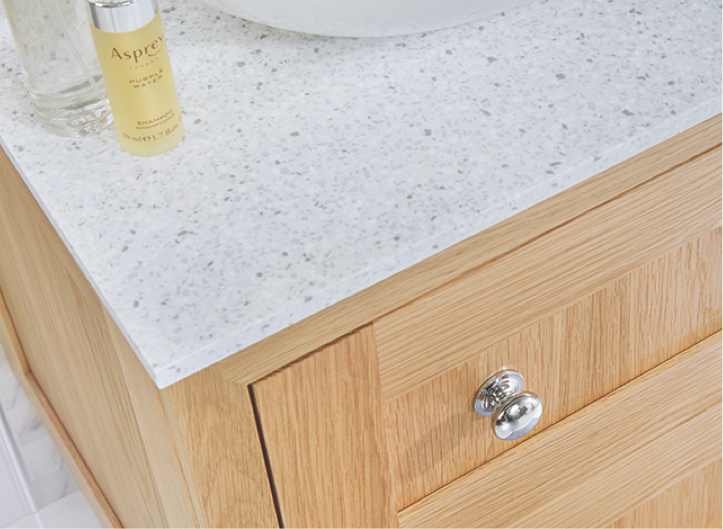 Ideal in an en-suite, both people using it can have their own defined drawer storage space under the resin bowls. Additional storage is achieved around the toilet unit, with both a base unit and single door sit-on cabinet. In a family bathroom, limited space usually only allows for bath, basin and toilet. When fitting furniture into a conventional bathroom, choose a glossy white, wall-hung basin unit to keep the room looking clean and bright, spacious and free from clutter. Give stunning Grey Gloss furniture the wow factor, by choosing softly marbled, gloss tiles on the walls and floor. Easy to maintain and easy to clean, gloss tiles, like gloss furniture never dates and will ensure that your bathroom will look fantastic for years to come. A compact bathroom will always benefit from simplicity. Choose base and wall units to give maximum storage along with a matching bath panel and the overall feel will be of cohesion. A mirror or mirror cabinet will add reflective qualities and ensure that the room feels as spacious as it possibly can. A luxurious Corian worktop with co-ordinating upstand contrasts beautifully with the rich tones of Dark Rockford units, to offer both valuable storage and designer looks. 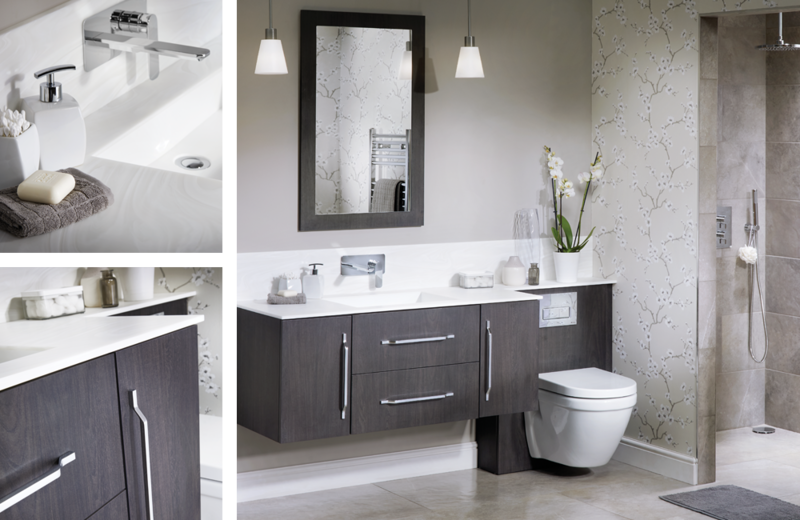 Complete the overall scheme with a feature wallpaper and give your cloakroom the celebrity treatment it deserves!